Defense Secretary Chuck Hagel warns lawmakers on the potential impact of failing to reach a deficit reduction and spending agreement with the White House on the fiscal 2014 budget. 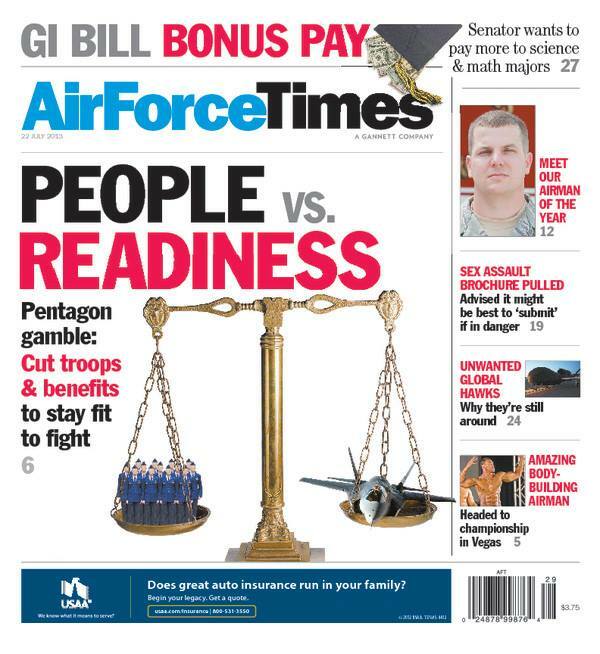 In this week’s Air Force Times, you can read about how this scenario would impact airmen – and the cutbacks Hagel proposes instead. Air Force Times also tells you about the Veterans Affairs Department’s opposition to a bill that would pay more to veterans pursuing math and science degrees than to English or political-science majors. In other news, meet 2013 Air Force Times Airman of the Year Master Sgt. William Janczewski, who fought a fire blazing precariously close to 40,000 gallons of fuel – while under mortar attack in Afghanistan. You can read about those events and how the birth of his youngest son with a heart condition inspired him to help other families in need. Janczewski is the assistant fire chief of training with the 19th Civil Engineer Squadron Fire Emergency Services Flight at Little Rock Air Force Base, Ark. You can also read about the two honorable mentions for Airman of the Year – a C-130J loadmaster instructor at Little Rock and a logistics readiness officer at Hill Air Force Base, Utah. And two senators propose a law that would make it easier for service members to cast their ballots.